Ridley Scott is widely lauded as one of the greatest film-makers of our time, but there’s a case to be made that he hasn’t made a good film since 2007’s ‘American Gangster’, the following five only managing to embody various degrees of failure. ‘Body of Lies’ and ‘Robin Hood’ were examples of Scott on autopilot, making unchallenging, passable fare of the kind that didn’t get him his legendary status. The true stinkers were to follow though, ‘Prometheus’ threatened to destroy the legacy of ‘Alien’, such was the sheer awfulness of almost every aspect of it, and ‘The Counsellor’ succeeded in wasting a great cast in one of the most dreary films of the decade. This, coupled with the fact that ‘Exodus: Gods and Kings’ didn’t exactly get the best of receptions, meant that Scott was firmly stuck in a rut. What better way to blast your way out of that rut than with a film that balances everything extremely well. 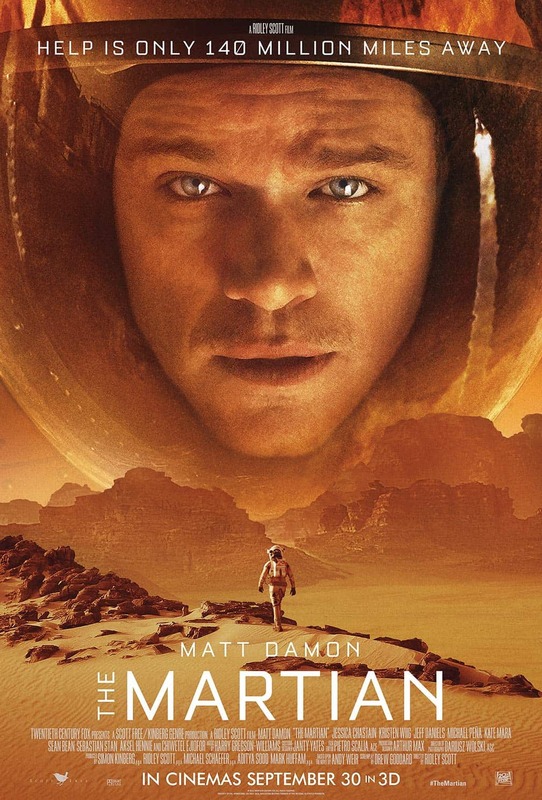 ‘The Martian’ is a film packed with humour, drama and an ample amount of tension, all intricately interwoven with a brilliant script by Drew Goddard and wonderful direction from Scott, who keeps the film ticking along at a fair pace, managing to ensure the film is always riveting even when it’s at its most technical. The cast are all fantastic, and boy is it a good one. Leaving aside Matt Damon, whose performance is typically reliable in the lead role, the likes of Jessica Chastain, Kate Mara and Michael Pena are all excellent, and the ensemble is further improved by the likes of Jeff Daniels and Chiwetel Ejiofor. Even Sean Bean turns up, and he’s always a welcome sight. Damon embodies the role of Mark Watney and negotiates what could have been tough scenes to carry with consummate ease, thriving in a scenario where most of his acting consists of monologuing in to a camera, while Pena and Chastain in particular are wonderful in their supporting roles. There are echoes of Christopher Nolan’s ‘Interstellar’ in the fact that Chastain and Damon reappear in a film about space so soon after the last one, but the film is markedly different and it doesn’t suffer at all. What Ridley Scott delivers here is a marked improvement on his recent output. Intelligent, thrilling and regularly funny, it’s a film that wows you and doesn’t let go. It does take a few liberties and some suspension of disbelief may be needed to make the story work, but it’s a mark of the quality of the film that these moments don’t overshadow what is a great accomplishment. Scott has ‘Alien: Paradise Lost’ coming up and while there may be previously have just been trepidation, this is proof that Scott is still a masterful director. It may just be the case of hoping the script is good enough too.